The Asia-Pacific team is very excited to be welcoming a new family to the Region! This upcoming March 2018, Rev. 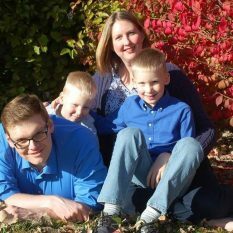 Nate and Hope Owens, along with their two sons, Forest and Peter, will be leaving their current home and ministries in Michigan and making their new home in Asia. They will serve as Regional Communications Coordinators and be based in Manila, Philippines. Their ministry assignment is crucial to the communication of the mission, development, and sharing of resources, knowledge, and encouragement on our region and around the world. Their role helps to fulfill our regional priority of Communication that Connects. While new to the Region, Nate and Hope are not new to ministry and missions. Nate served in Sunday School and Discipleship Ministries International (SDMI) and the USA/Canada Regional Office for eight years, while Hope served in Global Mission Personnel for seven years, both at the Global Ministry Center in Lenexa, Kansas. Nate’s parents also served as Nazarene missionaries for twelve years in the Middle East and West Africa. Hope taught English at Korea Nazarene University and served in Mission Corps at Africa Nazarene University. More recently, for the past year, Nate has been in the position of Associate Pastor for Student Ministries at Saginaw Valley Church of the Nazarene in Saginaw, Michigan. Nate is an alumnus of Mount Vernon Nazarene University and Hope is an alumna of MidAmerica Nazarene University. In 2016, Nate graduated from Southern Methodist University with a Masters of Dispute Resolution and Conflict Management.